The first quarter closed with hotels realizing steady gains in both business and leisure volumes and rates. 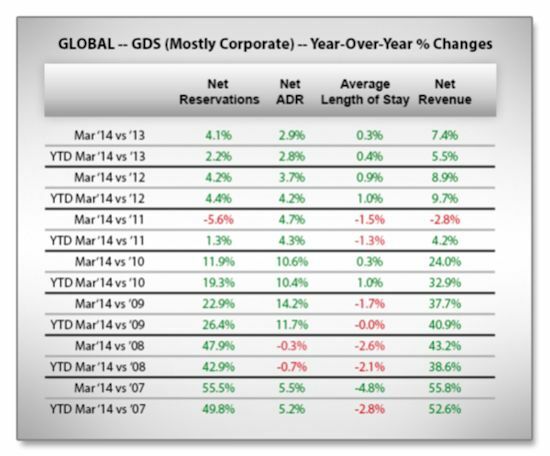 On a global level, each month saw increases over prior year in reservations booked through the global distribution systems (GDSs) and alternate distribution systems (ADSs), as well as in the rates paid for those rooms. Corporate volumes climbed from slight increases in January and February to a solid +4.1% over prior year in March, resulting in a +2.2% year-to-date growth pace. Rates paid by business travelers were at least +2.5% ahead of 2013 each month, averaging to +2.8% year-to-date. Leisure bookings peaked in February, but fell only slightly to +3.7% ahead of March 2013 by quarter's end. Rates for leisure reservations made consistent gains, reaching as high as +5.8% over 2013 by the end of March, setting a significant pace of +4.3% year-to-date. These increases can be attributed to a combination of pent-up and ongoing demand, which is enabling hoteliers to increase rates, maximizing profit potential. Forward-looking data suggests strong travel performance - for both channels - for the remainder of spring and into summer. 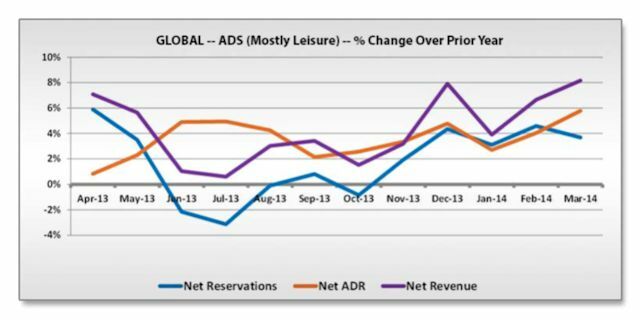 o Each month of 2014 has seen the year-over-year global corporate booking volume increase over the previous month. This, accompanied by single-digit but steady rate growth, is fed by companies' increased willingness to invest in profit-producing travel. o Leisure travel has already delivered an impressive performance this year globally, with volumes at least +3.1% over 2013 for January, February and March. As getaways gain budget priority, travelers are also willing to pay higher rates, as evidenced in the first quarter's data. 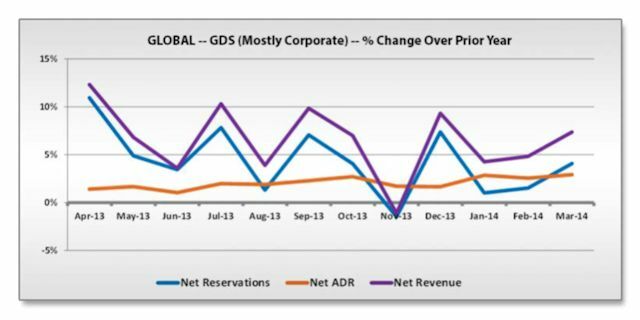 o Global GDS forward-looking data indicates corporate bookings will approximate prior year levels into summer, while rates will continue modest but consistent growth. 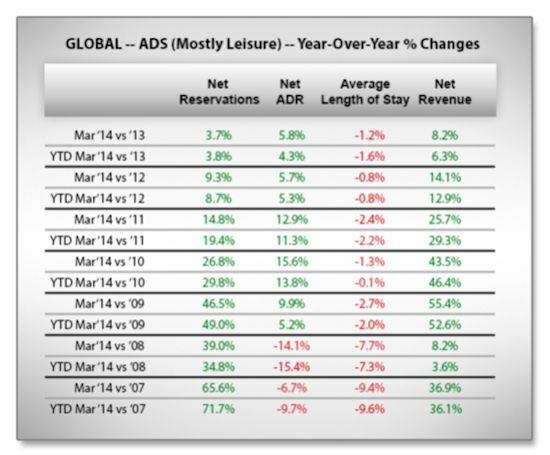 o Global ADS forward-looking data shows a combination of solid reservation and rate growth, averaging +5% through July. These increases will set the stage for revenue growth that could reach near double-digit levels with the onset of summer travel and major events like World Cup in Brazil. 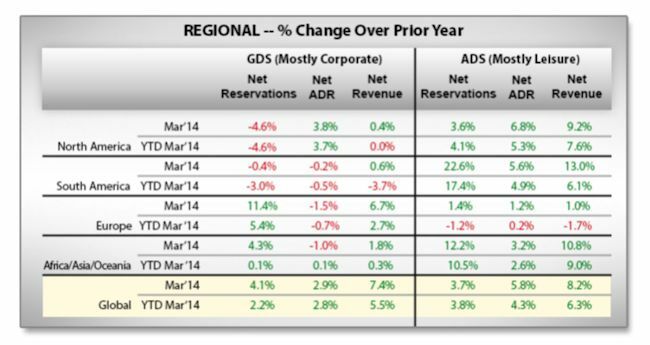 First quarter 2014 global performance for the GDS channel reflects strong corporate travel demand that continues to expand. January kicked off the year with business bookings ahead of January 2013 by +1.0%, with February and March bookings growing by +1.5% and +4.1% respectively. Some of the lift seen in March was due to the Easter holiday falling in April this year instead of March, which allowed additional business focus and travel. Overall, business travel demand is experiencing a steady rise that is affecting both the number of trips taken over prior year and room rates. Monthly rates increased at an average of +2.8% during the first quarter over prior year. January, February and March rates respectively rose by +2.9%, +2.5% and +2.9%. These increases drove revenue growth of +4.3%, +4.8% and +7.4% thanks to companies relying on the strength of in-person meetings. More trips are being taken for both transient and group business travel, as well as for small and large meetings. This mixed rise in trip types has resulted in shorter average reservation lead times than prior year. Trips were booked an average of 18.07 days in advance during first quarter 2014 versus 18.07 days during first quarter 2013. March trips were booked 17.65 days ahead in 2014 versus 18.65 in 2013. Trip length still seems to be contained to help control costs and keep travel return on investment in check. During first quarter, trips lasted an average of 2.17 days, versus 2.16 days during first quarter 2013. March trips averaged the same 2.14 nights as last year. Leisure travel delivered a powerful first quarter performance. Bookings increased by +3.1% over prior year in January, reaching growth of +4.3% for February. Even with the bulk of Easter holiday travel falling in March last year, bookings still surpassed prior year by +3.7%. Rates have been rising along with trip volume. Average daily rate (ADR) increased by +2.7%, +4.0% and +5.8% over last year for January, February and March. Reservation growth accompanied by rate growth demonstrates increasing demand. A combination of factors helped drive the increases, including: severe and continuing winter weather in some regions, improving economies feeding consumer incomes, and an upswing in travel by those unhindered by school schedules. Nevertheless, consumers are still selective in their spending. Trips are often being timed to take advantage of off-peak periods, packages and promotions. The average reservation lead time shortened for the quarter overall, from 22.94 days for first quarter 2013 to 22.88 days for first quarter 2014. But, it widened in March from 21.27 days in 2013 to 21.43 days in 2014. Trip length remains another means of enabling more travel and/or more upgrades. The average length of stay for the first quarter was 2.02 nights versus 2.05 last year, with trips booked in March lasting just 1.99 nights this year versus 2.01 nights last year. Business and leisure travel continued to perform well across all regions throughout the quarter. Corporate bookings remained close to prior year levels, even maintaining year-over-year gains in North and South America, while growing or maintaining prior year rates. 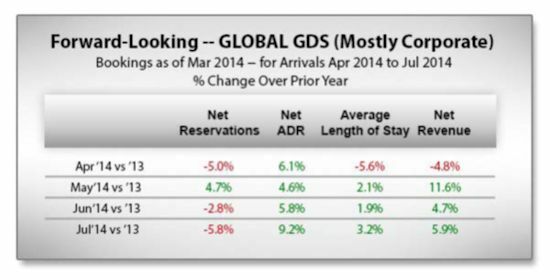 Africa/Asia/Oceania saw an uplift in total bookings, while Europe experienced noticeable improvements in corporate stays over prior year. Revenue in both regions was supported by stable rates. Leisure travel displayed the most impressive activity at the regional level. All regions showed progress, with South America and Africa/Asia/Oceana displaying double-digit booking growth in March. Each one demonstrated consistent rate improvement year-to-date with an uptick for the month of March. Global GDP growth forecasts continue to support expectations of moderate but sustained business and leisure travel growth. According to Kiplinger's latest forecast in April, worldwide GDP growth over prior year will be +3.3% for 2014 and +3.7% in 2015 (versus +2.9% in 2013). The forecasted 2014 and 2015 GDP growth for major markets (with 2013 actual growth), includes: United States at +2.7% for 2014 and +3.2% for 2015 (+1.8% in 2013), Euro Zone at +1.1% for 2014 and +1.7% for 2015 (-0.3% in 2013), China at +7.3% for 2014 and +7.2% for 2015 (+7.7% in 2013), Japan at +1.4% for 2014 and +1.2% for 2015 ( +1.8% in 2013), United Kingdom at +2.9% for 2014 and +2.7% for 2015 (+1.5% in 2013), Brazil at +2.0% for 2014 and +2.6% for 2015 (+2.4% in 2013), Canada at +2.3% for 2014 and +2.7% for 2015 (+1.7% in 2013), India at +5.2% for 2014 and +6.1% for 2015 (+4.2% in 2013), South Korea at +3.5% for 2014 and +3.3% for 2015 (+2.8% in 2013), and Mexico at +2.5% for 2014 and +3.7% for 2015 (+1.3% in 2013). Global GDS forward-looking data points to dependable volume with improved pricing overall. Bookings made thus far for arrivals April through July are hovering close to prior year levels, with an uptick for May arrivals nearing +5%. Rates are steadily growing at an average pace of +5% for booked travel through July. Recently revised 2014 forecasts from the Global Business Travel Association (GBTA) support these Pegasus indicators. US business travel spending is expected to rise +7.1% in 2014 to $293.3 billion, a substantial upgrade from the 6.6% growth to $289.8 billion predicted last quarter. Total trip volume is expected to increase +2.0% to 464.7 million trips. GBTA's outlook for group travel has also been revised to increase +7% in 2014 to $126 billion, up from the +6.5% growth predicted last quarter. ADS channel forward-looking global data suggests healthy leisure travel through the rest of spring and into summer. Bookings will continue to outperform prior year at an average pace of +5% through July, with rates nearing an average of +6% over the same period. Consumers worldwide are setting aside time and money for vacations. Outbound travel is increasing in general with distance differing due to cost constraints. Major city and beach locations remain popular as more up-and-coming destinations are replacing some of the mainstays in the name of uniqueness and value. Six of the top 25 destinations highlighted in TripAdvisor's 2014 Traveler's Choice Awards are located in Asia, and four of those cities jumped at least 10 places in the past year. The Pegasus View is a quarterly analysis of global booking trends available online and by free subscription at www.pegs.com. Data reported in The Pegasus View comes from billions of transactions processed monthly by Pegasus Solutions, the world's single largest global processor of hotel transactions. It is the only industry report to reflect data drawn from both global distribution system (GDS) and alternative distribution system (ADS) transactions, representing the business and leisure markets respectively for approximately 100,000 hotels worldwide. All data is on a date-of-booking basis unless otherwise stated. Average daily rate (ADR) and revenue percentage changes are calculated from values using a single constant exchange rate to eliminate the effects of currency exchange rate movements. Pegasus Solutions is the single largest processor of electronic hotel transactions, delivering advanced and affordable connectivity and distribution solutions to nearly 100,000 hotels worldwide. Pegasus connects hotels to crucial sources of business - it processed transactions valued at 14 billion USD for its clients in 2013 alone. In addition to foundational global distribution system (GDS) access and online connectivity, Pegasus delivers online, social marketing and booking solutions through its Open Hospitality division, and powerful reservation tools to convert and capture bookings. 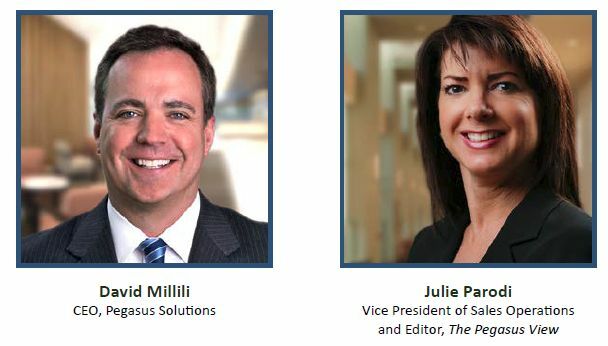 As a trusted partner in generating guest room demand and sales, Pegasus also offers hotels actionable business intelligence through its PegasusView Market Performance reports to help hotels understand and respond to changing market conditions.